Are You a Cookie Monster? Allow Me to Introduce You to Ruth! What do Toll House and Ruth Wakefield have in common? They were both formally introduced to Nestle for one. Ruth, wife, mother, former dietitian, author, baker and tourist lodge owner, made a boo boo in Whitman, Massachusetts on a cold winter’s day in her kitchen at the “Toll House Inn” in 1937—so she’s the first one to blame for your immense cravings and late night snack attacks! Ruth Wakefield began by preparing the recipes and meals served to guests at her Toll House Inn and gained local notoriety for her deserts. One of her favorite recipes was “Butter Drop Do” cookies. The recipe called for the use of baker’s chocolate and one day Ruth found herself without the required ingredient. She substituted a semi-sweet chocolate bar cut up into bits. However, unlike the baker’s chocolate, the chopped up chocolate bar did not melt completely, the small pieces only softened. Conveniently, the chocolate bar had been a gift from Andrew Nestle of the Nestle Chocolate Company. As the Toll House chocolate chip cookie recipe became popular, sales of Nestle’s semi-sweet chocolate bar soared. Andrew Nestle and Ruth Wakefield, now author of her new cookbook, “Toll House Tried and True Recipes” struck a deal. Nestle would print the Toll House Cookie recipe on its packaging and Ruth Wakefield would have a lifetime supply of Nestle chocolate. 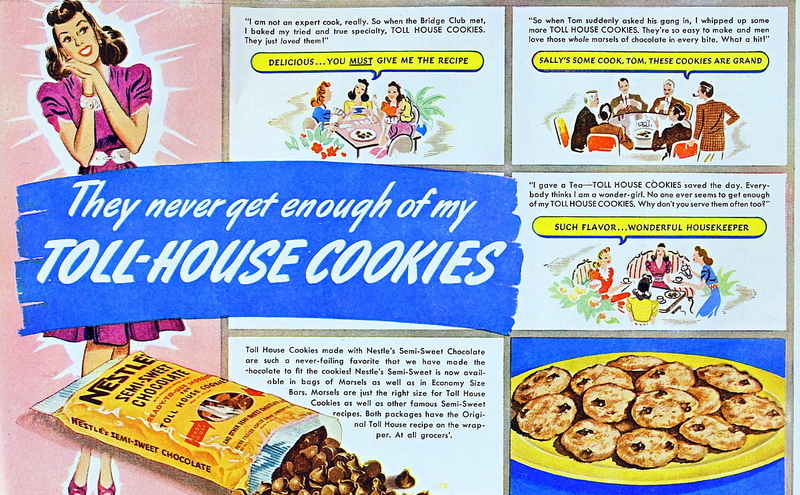 So, in 1938 the “Toll House Chocolate Crunch Cookie” aka chocolate chip, was introduced to America and rapidly became our favorite cookie— this still holds true today.